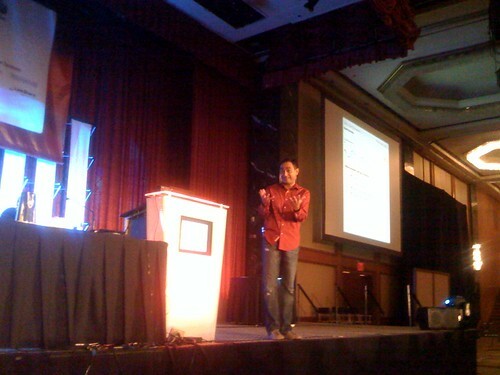 Have you ever heard Avinash Kaushik address an audience? It’s like watching a firework. Sparkling, irresistible and filled with the wisdom of the ancients. Well, I suppose Web analytics doesn’t go back quite as far as the pyrotechnics of 12th century China, but you know what I’m saying. I’ll try to bottle some of that magic now. 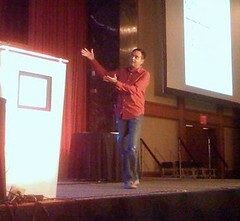 Mike Grehan introduces Avinash, @avinashkaushik, as a dynamic force of nature and our keynote speaker takes the stage. He says that he is the co-founder of Market Motive, which offers courses in online marketing. He also authors the blog Occam’s Razor, and wrote Web Analytics: An Hour a Day and Web Analytics 2.0 — books that teach about the evolving and changing world of analytics. He made $80,000 for each book and donated the money to charity. So today he’ll be talking about how the Internet has evolved our fundamental belief about relationships. He’s going to tell four stories that highlight challenges we face. He puts up a screenshot of an analytics report, which he calls a data puke. There are 20,000 keywords being tracked and how can you possibly manage that many keywords when you can only visualize about 20? The solution is to filter with in-line segmentation. When you key in on the keywords you want to investigate, you apply a filter and that’s when you can break down. Reduce the massive glob of data to something very manageable. Wordle.net: They’re a fantastic way of visualizing tons of data. Go to Wordle.net and take 100s of 1000s of keywords and distill it on a one page image. If your keywords are evenly distributed, you can see it. You can see if your site is actually relevant to the keywords you’re interested in. If the business strategy is to do X and the reality is Y, are we really achieving what we want? Juice Keyword Trees: You can see where a term connects with another term. Then by size you see how many people are coming in on that keyword and by color you can see how many people bounced away. You may find that in some cases you’re very diversified. The common pain point around the world is I don’t have the resources I need. I don’t have a good CMS. But really, the problem is that they’re focusing on the wrong thing. Look beyond conversion rate. The average conversion rate in the U.S. is 2 percent. That’s not the whole story. Avinash tried to convince his wife that he should blog, even though he could only do it late at night when the kids were asleep. She would tell him go to bed. So he tried to give her good reasons. His point: I am kind of a big deal. Her response: Go to bed. This piece of data didn’t convince her. His point: I had more than 73,000 visits from 176 countries last year. Her response: Go to bed. This piece of data is a stronger version of the one above, but it didn’t connect with his wife. His point: In the last month I made $26,000 fake dollars (a number found by quantifying the value of assets, such as clicks to sign up for a presentation he’s making at a conference). Her response: Work harder. That’s what you want. You want to talk to people in language and numbers that mean something to them. It’s really important to have goals. You don’t want to focus on the 2 percent of conversions. You want to know about the 98 percent of other activities going on. If you were tasked with measuring the success of tripadvisor.com, you would be missing out on so much if all you looked at was rooms booked. On his blog, about half of his traffic comes from search. This is pretty typical, but if you think about it, of those 40,000 visitors coming from search, they’re coming in from 26,000 keywords. He’s only focused on about 10 keywords, and 5,000 visitors come from them. Then the 26,000 keywords are brining in 35,000 visitors. So why obsess about a handful of brand keywords? When you dig into the data you find your head is your brand terms. But people who come from the long-tail are reusing key phrases, typically connected to your category rather than your brand. The other fascinating thing about these long-tail users is that they’re not sure what they want. If you can get in front of them and convince them first, you get their business. He was recently searching for cameras for a friend and he realized that Kodak was totally dropping the ball. He would search for the features they said were they’re big selling points. No Kodak. He would search for words directly from their site. No Kodak. He searched for a specific camera they make. There’s the camera, but not on Kodak’s site. Kodak has taken the opportunity to find the right person at the right time, and squandered it. And it’s not just Kodak. Try it for Best Buy, Orbitz, Cisco, and Victoria’s Secret. It’s happening most of the time. These companies are thinking that of the consumer market. There’s a bunch of people that already know them. But you can’t stop and not try to grow your consumers. The Google AdWords Search-based Keyword Tool compares search queries and the robot indexed pages, or in other words, pages the Web has plus queries that are actually being searched. You can see what keywords are in your budget. You can look at actual queries. This is actual data. Whether you show up or not, the traffic is going to go by. Like salmon traveling in the stream, be like a bear with your mouth wide open. The salmon will hop right in, as long as you’re there to catch them. There are many different ways a conversion funnel can occur. What if before a conversion is made, the consumer sees ads, goes to an affiliate site, does searches, over a period of months. How can you attribute the sale? So do we freak out and cry? Not yet… Go back and consider “is this a problem for me, in my case?” Run the Visits to Purchase report (available in every platform). You might see that 80 percent of conversions happen within two visits. In that case, this isn’t a problem. Now if it looks like most of the conversions happen in 9 visits, then it’s an issue for you. Q: Why’d you give your e-mail 20 percent credit? A: Because my e-mail team is really big. There’s also a decay model, where the actions farther back in time from the conversion gets less credit. This is the least worst model. Last click gets 75 percent of credit. The point is that they can go back in history, that they put logic to their model. This is what you should strive for. Is attribution going to go away? It’s not about crediting — it’s about the mix of media that’s the most productive for you. Here are a couple ideas of what the future may look like. Media Mix Modeling: spend a test campaign in a number of key cities around the U.S. In each of the cities pick a platform, PPC, SEO, YouTube, etc. Then you’ll have the data to figure out the mix with the lowest CPA.